Providing food and water for birds with my gourd bird feeder in my yard, has become an enjoyable year-round project. You can make your own feeder very easily and the birds love them. You can raise your own gourds or you can also find them at farmers markets as well as the grocery store. Some craft shops even have them during the fall. I have even bought them on Ebay. They have a great selection and you can get them pretty cheap! Gourds can range in size from 1"-24" in diameter. They come in different shapes and hue, with most falling in the tanned-leather color range. Hand tools, scroll saws and sharp knives can be used to cut the shell. I usually drill a hole first and then insert the saw blade to cut the gourd..
A Dremel is great for sanding the edges or even sand paper works well.. If you intend to use the gourd with food, it's very important to clean and smooth the porous interior using sand paper.. If you want color, finish the inside and outside of the gourd with stain. I personally like to leave mine with the natural look..
Clear-coat both interior and exterior surfaces with water-based urethane or food-grade wax..
You need to drill drainage holes in the bottom of the feeder so rain won't collect in it and produce mildew or rotten seeds. I also cut a piece of window screen to put in the bottom of the feeder. This helps prevent seeds from falling through the drainage holes or clogging up the holes. If you are just using the bottom half of the gourd you need to drill 3 holes evenly spaced around the edge. Put your string or twine through the holes and tie a knot. Bring all three strings up and make a loop and tie off. You have know made your own hanging gourd bird feeder. 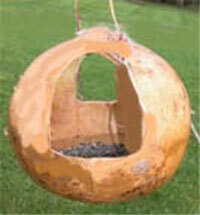 You can also use a round gourd and cut the sides out to make a bird feeder like the one pictured above. Gourd bird feeders are a very nice gift. They are also good sellers at craft shows. If you make bird feeders and would like to share information please contact me and I will add your idea.